In 1927 the Constitution was amended as to officers. There was the President, the Vice-President and the Treasurer. The Recorder and Secretary were combined into one office. The number of Clubs had risen to 32. At this time, the Cat Review lists the Clubs of the other Associations as ACA with 26 and CFF with 8. Up until now, the Executive Board meetings had been closed to all but members of the Board, but this year the Presidents of the member Clubs were invited to attend. For some reason not quite clear, Mr. Horne resigned in December as President, and Mrs. Gertrude Taylor, the Vice-President, was appointed to fill the vacancy. Shows were progressing – 19 were held – and at them Junior and Senior kitten classes were set up. Also, Blue Point Siamese were recognized and entered in Championship classes. The schedule of points for Siamese Specialty Shows was set: 5 cats – point; 8 cats – 2 points; 10 cats – 3 points; 15 cats – 4 points. One extra point was allowed for the Best of Breed, Male and Female, at all three point shows or more. In 1929, 35 regular clubs and 1 associate club were listed. An associate club might have been a poultry club, a State Fair, or a club for the advancement of Budgies. This still holds true, for the present Constitution states, “A pet stock or other association organized with the purpose, among others, of holding a show or shows of cats in connection with shows of other animals may, upon election, become an Associate Member with annual dues of $10.00, but not a full member of this Association”. Mrs. Gertrude Taylor was elected President, and Miss Elsie Hydon, Vice-President. Listing fees were abolished for neuters. In 1929 the treasury was in good shape - $2,018.79 being reported. It was even voted to pay Mrs. Taylor’s expenses of the trip from Detroit to attend the meeting! Miss Lillian Goodwin, an outstanding Silver breeder and a tireless worker for CFA for many, many years, was appointed to the Executive Board. 1,071 cats and 43 new Catteries were registered, and 48 Championships were granted. In 1930, Grand Championships were established. These were awarded on completion of ten points, one point to be alloted for each three Champions in a show. 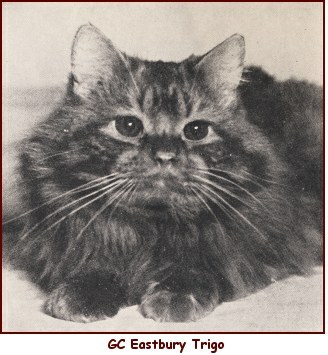 Mrs. J. S. Hunter’s red tabby male, Eastbury Trigo, Imp, was the first cat to receive this honor. 58 Championships were granted – the largest number yet in a single year. In 1931, the Foundation Record took the place of the old Register. Certificates for Stud Book were to be white, and Foundation Record blue. AOC classes were omitted, to be substituted by Household Pet classification. (Breeders were barred from this). Special classes for children not exceeding 15 years of age were set up. Other classes which were added: American Bred (for all cats bred in the United States or Canada, Champions barred); Bred by Owner; Color Bred (parents must be same color as entry); Brace (two cats as evenly matched as possible). Miss Lillian M. Goodwin was elected Secretary-Treasurer. Mrs. Olive Gilbert resigned as Recorder, and Mrs. A.H. McCarthy was elected to succeed her. It was moved and carried to present Mrs. Gilbert the CFA desk she had used for 12 years. A separate class was established for Grand Champions, to include all colors. Sadly enough, in April of this year, the Cat Review which had so faithfully recorded CFA news for many years, ceased to exist. Although not a CFA judge at this time, approval was granted for Mrs. Saxby Mabie to judge the Montreal Cat Club show. At the 1932 Annual Meeting, there was dissatisfaction on the part of same as to the seating of the Board of Directors by appointment. Legal advice was sought regarding appointment versus election of Directors to the Executive Board. Mr. G. Evans Hubbard was employed, and the Annual Meeting was adjourned for one month to await his findings. Rules were suspended, and Mr. Hubbard was seated as Chairman. Now, for the first time, seven members of the Executive Board were elected by the delegates. A committee was appointed to prepare amendments to the Constitution and By-Laws, and to revise the Show Rules. Miss Hydon was Chairman and Miss Goodwin, Secretary. The committee was authorized to employ Counsel at a cost not to exceed one hundred dollars. It was voted that a recommendation be made to the Committee on Amendments to the Constitution that the activities of the Cat Fanciers’ Association, Inc., be restricted to the United States of America. Because of this action, the Montreal Cat Club and Humane Society, the Royal Canadian Cat Club, the Hamilton Persian Society and Cat Club, Inc., and the Buffalo Cat Fanciers Club resigned and formed the International Cat Council, a fourth Association.